You don’t have to go far to find interesting subjects. 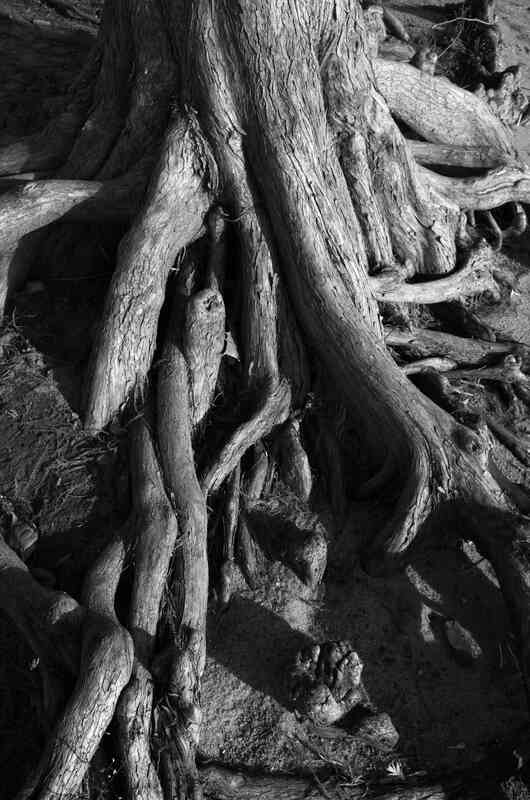 These are the roots of a living tree, where the lake has washed away the sandy soil from around the base. The water of the lake is just a few inches to the right of the photo. To put the location in perspective, this tree is the tree on the right in the Fall Sunset photo. About 75 yards to the left is where the Low Flying Geese were shot. Looking out to the right is roughly the location for both Painted Sunset and Sunshine Silhouettes. Diagonally on the other side of the lake produced the Walk Around The Lake pictures. Waiting for the right lens are hundreds of seagulls (probably terns) which fly in at dusk and rest on the lake for the night. Pretty soon the back waters of the lake will start to freeze over bringing another perspective for the camera. Without a doubt there will be some snowy days before the winter is over. And then comes spring . . . This entry was posted on 01/04/2015 at 08:26 and is filed under Photos. You can follow any responses to this entry through the RSS 2.0 feed. You can leave a response, or trackback from your own site.